Apartment 2/4 beds, 40 sqm well furnished slightly subordinated to the large garden, consisting of one by a veranda of relevance, with sunbeds, table and chairs with outdoor shower for exclusive use. The apartment has a comfortable and private bedroom with a double bed which can be divided into separate single beds. The living area consists of a single room that serves as a dining room and kitchen, inside which there is a double sofa bed. The bathroom with shower and bidet is separated from the two rooms by a hallway. The apartment is equipped with all the necessary appliances to make your stay even more pleasant: TV, washing machine, fridge, oven, hairdryer, iron with ironing board, pots, crockery, fans, mosquito nets and air conditioner with heat pump. The large common garden with the other three apartments in the villa is equipped with barbecue, wooden gazebo, parking, shower and direct access to the sea. Esperienza magnifica. L'appartamento è pulito, fresco e ha tutto quello che serve. In ogni caso, il proprietario, Giuseppe, è veramente gentile nel provvedere ad eventuali bisogni. La doccia esterna che si vede nella foto è molto comoda per una sciacquata veloce di ritorno dal mare, che dista circa 30 secondi a piedi dalla villetta (ovviamente non è l'unica doccia). La posizione è eccellente per raggiungere le principali bellezze della costa salentina orientale, ma anche la sola Porto Badisco è di per sè una bellissima località: protetta dalle correnti provenienti da nord, acqua cristallina, scogli per tuffi, disponibilità di gite in canoa e ben servita in quanto a cibo e bar. Lo consiglio di cuore! Nous avons passé 3 jours formidables dans la maison de Giuseppe. Nous étions dans la partie haute avec la terrasse qui donne sur trois côtés. une situation idéale pour prendre petit-déjeuner, déjeuner et dîner au soleil. La maison est vaste et fonctionnelle à deux pas de la mer. Nous sommes partis de là faire des balades à pieds dans un paysage magnifique. Giuseppe a été très attentif à notre confort. Il y avait des biscuits, de l'huile et de l'eau minérale offerts à notre arrivée. Comme nous avions un peu froid (c'était à Pâques) Giuseppe nous a apporté du bois pour faire un feu de cheminée. Vraiment une expérience formidable et un dépaysement total et tout cela dans le plus grand calme. On regrette juste de ne pas avoir loué pour plus longtemps. The villa and its surroundings were a bit less secluded than we expected based on the pictures, but we certainly had a good time. Porto Badisco is quite small (a few streets with some restaurants) which makes it the ideal location for relaxing, reading, taking a swimming break (just outside the gate you can go down the rocks and jump in the water or walk 10 minutes to the sand beach) or making a day trip to Otranto or Lecce. The apartment is basic, but it's got everything you need. Just around the corner there's a bar/shop where you can get fresh bread and some food, the supermarket is 10 minutes by car. Giuseppe and his family are very welcoming: they prepared a list with things to visit and restaurants in the neigbourhood (several places where you can eat seafood at a good price, and we can confirm that Agriturismo Le Tagliate is definitely worth a visit! Fresh, tasty food at reasonable prices in a charming setting), they checked whether we needed anything from time to time and we even got typical Italian cookies when we left! Abbiamo avuto un soggiorno molto piacevole nell'appartamento di Porto Badisco. La sua posizione è veramente comoda per poter scendere con pochi passi dal giardino al mare e bagnarsi nelle acque cristalline del golfo. E' anche una base per escursioni in Salento o nella vicinissima Otranto. I proprietari sono molto gentili e disponibili per fornire ogni informazione utile a rendere piacevole la vacanza. 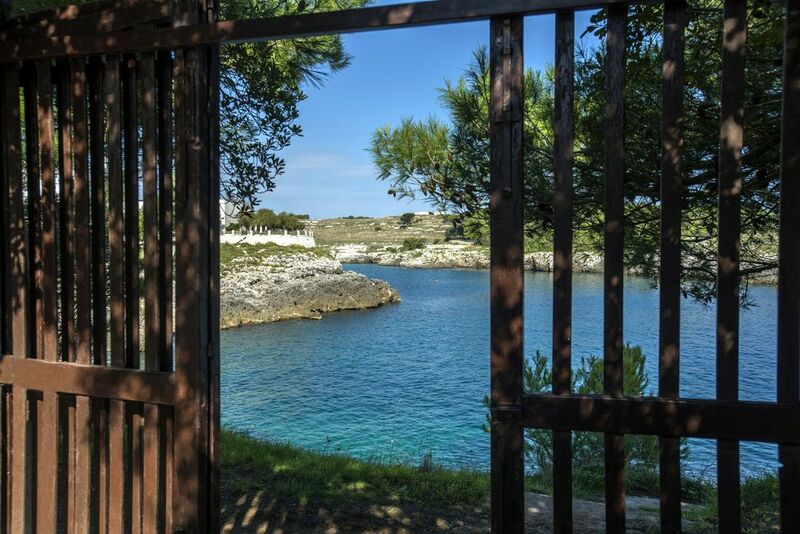 Porto Badisco, renowned seaside resort of Salento, located a few km from the towns of Otranto (blue flag 2014-15-16-17) and Santa Cesarea Terme, on one of the most beautiful stretches of the Adriatic coast. The harshness of the rocks caressed by the clarity of the water creates a mix of sublime beauty: beautiful seabeds and beautiful and quiet coves allow swimming, diving, diving, snorkelling, canoe trips and unforgettable pedalos. The place lends itself to peaceful holidays, but in a matter of minutes you can reach more worldly and chaotic places where you can spend more lively evenings.